I’m a fan of no bake desserts year round. In the heat of summer, I don’t feel like turning on the oven so I turn to my arsenal of quick and easy treats. My house doesn’t have central air and the humidity can be so stifling at my home in the Ottawa Valley. I don’t want to make my home any hotter than it needs to be. 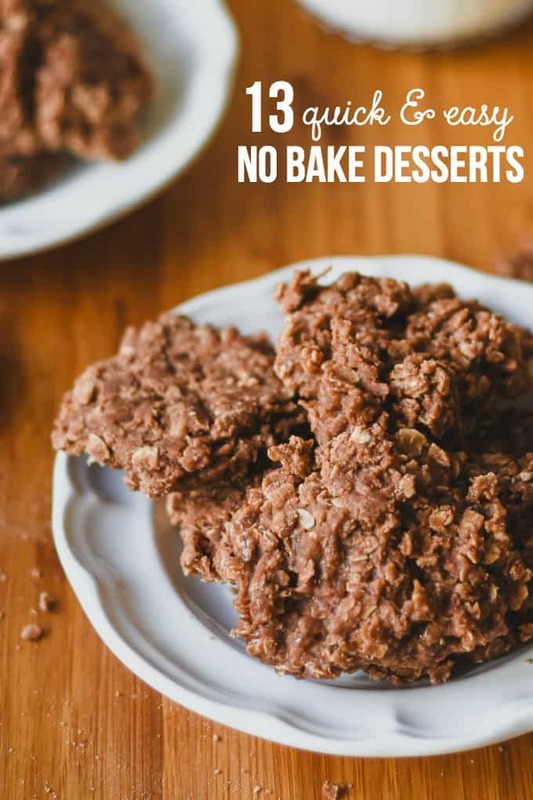 I went through my recipe box and found 13 quick and easy no bake desserts that our family loves. If you are a regular reader, you may have seen these recipes already. If you’re not, here is your introduction. These desserts are in no particular order. I hope you’ll have a chance to try some out and if you do, please come back and let me know what you thought! What is your favourite no bake dessert? This would be good for the summer. Especially when it’s super hot and running the oven is torture. what happened to the No bake cherry tarts? The others recipes that I clicked came up. Love No Bake Desserts especially in the summer, will have to check these links out! Thanks!